Endless Love | Wedding WordPress Theme, powering your care for your lover, wedding, happiness celebration & website to new heights. Responsive, fast, interesting interaction feature packed & supported by top authors. Endless Love is dedicated to celebrating wedding, couple website. Endless Love design uniqueness brings beautiful & amazing experience to its visitors. It is easy to use so it will surely satify almost users’ expectation. Wonder if Endless Love is the WordPress Theme made for you? Are you going to marry in the next few weeks or months and want a website where your relatives & friends (even on the other corner of the world) can reply to your invitation and give you a wish? 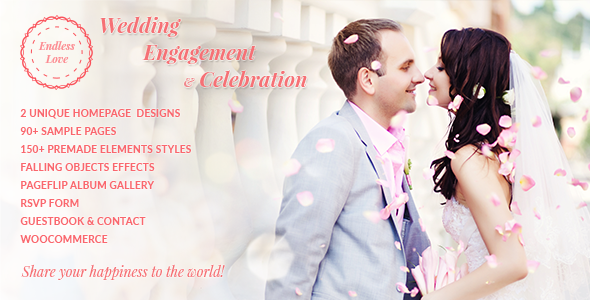 Are you a wedding agency and want to create a website for your couple clients as an addon services or a gift? Are you a bride or a groom and want to surprise your partner with all effort to build a website to celebrate this by your own? Are really want a multicocept with mass premade handcrafted elements so you can change your sites when you find it interesting? Do you really need a WoW reaction when users visit your website, a website which show how you cares about your love? Do you need to build your website with an impressive and share this everlasting love to the world? Do you want a very affordable yet useful & powerful solutions developed by UI/UX/Development experts who have around 10+years in the Website industry? Your users will be impressed by the interaction & special effect, multiple niches and possiblities that the theme provide. Menu is designed & developed with multiple layout & styles variants for you to choose from. Create almost any kind of element you can imagine with a wide range of Shortcodes packaged with Endless Love. Shortcodes that are designed to make your life easier, you can easily create quite a complex range of design elements or blocks of content without really needing to code anything. With specific Shortcodes you will find the right kinds of tools for the job including portfolio, gallery, friends, party, ceremony… shortcodes that offer a wide range of functions that are stylishly fitted to slide into the theme with a few clicks. Which is why Endless Love comes 100% device ready and compatible, so that no matter where your customers are or what device they are viewing your new website on, Endless Love is going to display it to pixel perfection and scale seamlessly to suit the end device. That is called a Responsive website, and we have got it covered. With so many facets of business uses for Endless Love we thought carefully about what kind of content you might be creating, and came to discover that each kind of business has specific needs when it comes to content and post types. You can choose from a range of different strong post types such as Portfolio, services, team, party, ceremony…and more to meet your needs. Included in your one of purchase price are the best selling Drag & Drop Page Builder Visual Composer, the best selling Slider Revolution, and the Premium PSD Pack which saves you an additional $73! With our optimized Oneclick Demo Importer & alternative XML importer, you can get the same as our live demo within clicks. All of the features you have seen and so much more and all carefully documented for your perusal to ensure that you get the most out of your new website built with Endless Love . VisuWe believe speed should be at its best in order to keep visitors staying longer. We created the optimization setting to minify, cache CSS, JS, HTML. You don’t need to install such plugins to make your site load faster. Just turn it on with 1 click in our Theme option. The most popular eCommerce plugin WooCommmercein under your mouse, you can setup an online shop to sell cleaning assests & accessoaries within mins.